In a recent conference call Amazon has announced that it has reached over $131M in sales during the fourth-quarter of 2007 from its Web Services, which much or less means more than $500M in revenues for the entire fiscal 2008 for Amazon coming solely from its Web Services. When compared to the $5.7B for the same quarter coming in from its core business activates that amount looks tiny and small, but it is symbolic for the major transition undertaken at Amazon to shift the focus from simply an online retailer to a broader Internet company and mostly an innovator in the web space. We are also sure that the margins are surely greater in the web services field for Amazon than the profits derived from its traditional retail business. Standing alone the Amazon Web Services’ revenues are certainly huge and newsworthy. Amazon Web Services turn out to be a very successful strategy for Bezos’ globe-spanning empire to drive sales and profits up. The company claims as well there are over 60,000 different customers across the various Amazon Web Services. What is also interesting and noteworthy from the information that recently became publicly available online is the fact that the biggest users of Amazon Web Services are not the army of web 2.0 start-ups but large-scale corporations from the banking and the pharmaceutical sectors. Amazon Web Services provides developers with direct access to Amazon’s robust technology platform. Build on Amazon’s suite of web services to enable and enhance your applications. We innovate for you, so that you can innovate for your customers. Amazon WS include Amazon Elastic Compute Cloud, Amazon SimpleDB, Amazon Simple Storage Service and Amazon Simple Queue Service. Amazon Elastic Compute Cloud (Amazon EC2) is a web service that provides resizable compute capacity in the cloud. It is designed to make web-scale computing easier for developers. Amazon EC2’s simple web service interface allows you to obtain and configure capacity with minimal friction. It provides you with complete control of your computing resources and lets you run on Amazon’s proven computing environment. Amazon EC2 reduces the time required to obtain and boot new server instances to minutes, allowing you to quickly scale capacity, both up and down, as your computing requirements change. Amazon EC2 changes the economics of computing by allowing you to pay only for capacity that you actually use. Amazon EC2 provides developers the tools to build failure resilient applications and isolate themselves from common failure scenarios. Amazon SimpleDB is a web service for running queries on structured data in real time. This service works in close conjunction with Amazon Simple Storage Service (Amazon S3) and Amazon Elastic Compute Cloud (Amazon EC2), collectively providing the ability to store, process and query data sets in the cloud. These services are designed to make web-scale computing easier and more cost-effective for developers. Traditionally, this type of functionality has been accomplished with a clustered relational database that requires a sizable upfront investment, brings more complexity than is typically needed, and often requires a DBA to maintain and administer. In contrast, Amazon SimpleDB is easy to use and provides the core functionality of a database – real-time lookup and simple querying of structured data – without the operational complexity. Amazon SimpleDB requires no schema, automatically indexes your data and provides a simple API for storage and access. This eliminates the administrative burden of data modeling, index maintenance, and performance tuning. Developers gain access to this functionality within Amazon’s proven computing environment, are able to scale instantly, and pay only for what they use. Amazon Simple Queue Service (Amazon SQS) offers a reliable, highly scalable, hosted queue for storing messages as they travel between computers. By using Amazon SQS, developers can simply move data between distributed components of their applications that perform different tasks, without losing messages or requiring each component to be always available. Amazon SQS makes it easy to build an automated workflow, working in close conjunction with the Amazon Elastic Compute Cloud (Amazon EC2) and the other AWS infrastructure web services. Amazon SQS works by exposing Amazon’s web-scale messaging infrastructure as a web service. Any computer on the Internet can add or read messages without any installed software or special firewall configurations. Components of applications using Amazon SQS can run independently, and do not need to be on the same network, developed with the same technologies, or running at the same time. There are many other companies in the sector and among others are Nirvanix (recently received funding from European Founders Fund) and RackSpace’s Mosso. A couple of days ago when we wrote about a tiny start-up that raised venture capital for an online collaboration tool built around Microsoft Excel we did not fully realize how crowded the market is. Today Mashable has put up a very nice and comprehensive list of all things spreadsheet – or in other words 14 online spreadsheet applications, eXpresso among them. Nice thumbnails are taken on any of the sites below and can be seen on Mashable. BadBlue.com – Features free personal accounts or paid enterprise class services for sharing Excel spreadsheets over the web. Blist.com – Still in private beta, and here is the Mashable’s detailed write-up on what you can expect from this new spreadsheet app. EditGrid.com – You can upload your existing spreadsheets, start new ones, and share & collaborate with friends and colleague. Google Docs – No list of online spreadsheet apps would be complete without the ubiquitous mention of Google Docs. It feels, and looks, a lot like Microsoft Excel and is easily shareable with others. InputWebWizard.com – Works your spreadsheets with a database so all of your data is stored in a SQL database. System is set to help you develop web apps, but still seems a bit pricey at $499 a month. JotSpot – Import and Export with Excel, copy-and-paste from Excel, share the documents, even use hyperlinks and attach files. Numbler.com – A plain, straightforward, collaborative spreadsheet application. NumSum.com – A more social spreadsheet app where you can leave your work totally open if you choose and allow others to comment on it. Peepel.com – Import your Excel spreadsheets, work with multiple documents in the same browser window, get an RSS feed of the latest changes to collaborative documents and more. 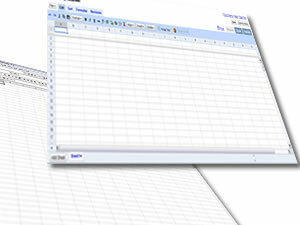 Sheetster.com – Has the normal online spreadsheet features such as collaboration, but also offers blog embedding options. Simple Spreadsheet – An open source project that is part of the Simple Groupware Solutions project. Free to use and 100% web based. ThinkFreeDocs.com – For now, you can not edit uploaded spreadsheets via the site, but they are working on it. Upload what you have and share it. Zoho Sheet – Part of the Zoho suite of online office applications, Sheet will allow you to import and export with Excel, collaborate with others, and even do quick “throwaway” sheets if you just need to scratch something out. Inform Technologies, a technology solution for established media brands, has received a $15 million investment from Spark Capital, a Boston-based venture fund focused on the intersection of the media, entertainment and technology industries. The company said in their PR they are going to use the funds to accelerate growth. The company also claims nearly 100 media brands use Inform’s journalistic technology to enhance their sites. Founded in 2004, Inform currently works with nearly 100 major media brands to help them ensure that their sites are content destinations and offers editorial-quality features that keep readers engaged on their sites longer – and that increase page views and revenue potential. Inform’s key offering is a technology solution that acts as an extra editor. It starts with a page of text, and then, with editorial precision, it automatically creates and organizes links to relevant content from the media property’s site, its archives, from affiliate sites and/or anywhere else on the Web. As a result, each page on a site becomes a richer multimedia experience. Longstanding Inform clients include Conde Nast, Crain Communications, IDG, The New York Sun and Washington.Post.Newsweek Interactive. In recent months, 30 additional media properties have engaged Inform – many already running Inform’s technology on their sites. Inform uses artificial intelligence and proprietary rules and algorithms to scan millions of pages of text and read the way a journalist does – identifying key “entities,” such as people, places, companies and products, and recognizing how they connect, even in subtle and context-specific ways. The software continually teaches itself – in real time – how information is related and automatically updates links and topics as the context changes. “We’re delighted that our new investor understands how effectively we partner with media companies and how our technology serves their business and editorial objectives. We will use the capital to expand our operations and implement our approach to accelerating our growth.” Said Joseph Einhorn, Co-Founder and CTO of Inform. We went over Web and researched a bit over the company. It turns out the company has shifted the focus quite often over the past several years. In 2005 the company once said to be around to provide a useful news interface – both blog and non-blog – and to show the interconnectedness of all of the content. Later the same year a major re-launch and re-design struck the company and they have given up on the Ajax based pop-up and have also added vide and audio, which hardly fits into the concept of contextual connection between two content areas/texts based on their semantic textual analysis, unless they have come up to an idea how to read inside and understand image and video files. Google, by contrast, seems to have come up to technology that claims to recognize text in images. In late 2006 the company brought to the market their so called Inform Publisher Services, which was aimed at big web publishers, and was designed to help them increase page views by adding relevant links to other, hopefully related, content in their archives. The new service was meant to automatically create links in existing articles, which link to a results page containing relevant content from the site as well as from the web, including blogs and audio/video content. Sounds like Sphere and LinkedWords. Basically their latest offering comes closer to what the Inform.com is today. Some critics on the service have published the following doubts online over a few blogs we have checked out in regard to Inform. Isn’t this the opposite of semantic web, since they’re sucking in unstructured data? How does their relatedness stuff compare to Sphere and how do their topic pages compare to Topix? Marshall Kirkpatrick from RWW has put it that way when the question about standards and openness was raised. Competition include Sphere, Proximic, Lijit, Adaptiveblue, LinkedWords, somehow NosyJoe, Jiglu, among others. Other, although remote, players in this space include Attendi, Diigo, Twine and Freebase. Inform Technologies is a new technology solution for established media brands that automatically searches, organizes and links content to provide a rich, compelling experience that attracts and retains readers. With editorial-quality precision, the technology understands textual content and recognizes subtle differences in meaning. Further, the technology automatically creates links – in articles and on instantly generated topic pages – to relevant content. This deepens a site and engages readers. Inform’s Essential Technology platform is an artificial intelligence and natural language-based solution that serves almost as an “extra editor” using rules and algorithms to “read” millions of pages of content, identify entities, such as people, places, companies, organizations and products, and topics, to create intelligent links to other closely related information. The technology is also able to recognize subtle differences in meaning and distinguish people, places and things based on local geographies or unique identities. Inform’s Connected Content Solution and Essential Technology Platform are used by major media brands including CNN.com, WashingtonPost, Newsweek Interactive, Conde Nast, Meredith, IDG and Crain Communications. Founded in 2004, the company is privately held and has approximately 60 employees, including mathematicians, linguists, programmers, taxonomists, library scientists and other professionals based in New York and India. Spark Capital is a venture capital fund focused on building businesses that transform the distribution, management and monetization of media and content, with experience in identifying and actively building market-leading companies in sectors including infrastructure (Qtera, RiverDelta, Aether Systems, Broadbus and BigBand), networks (College Sports Television, TVONE and XCOM) and services (Akamai and the Platform). Spark Capital has over $600 million under management, and is based in Boston, Massachusetts. Spark has committed to investing $20 million in CNET equity. In what’s Microsoft’s second largest deal for the past 12 months the company offered to buy Fast Search & Transfer ASA, a leading provider of enterprise search solutions based in Norway. Details are as follows: Microsoft Corp. today announced that it will make an offer to acquire Fast Search & Transfer ASA (OSE: “FAST”), a leading provider of enterprise search solutions, through a cash tender offer for 19.00 Norwegian kroner (NOK) per share. This offer represents a 42 percent premium to the closing share price on Jan. 4, 2008 (the last trading day prior to this announcement), and values the fully diluted equity of FAST at 6.6 billion NOK (or approximately $1.2 billion U.S.). FAST’s board of directors has unanimously recommended that its shareholders accept the offer. In addition, shareholders representing in aggregate 35 percent of the outstanding shares, including FAST’s two largest institutional shareholders, Orkla ASA and Hermes Focus Asset Management Europe, have irrevocably undertaken to accept the offer. The transaction is expected to be completed in the second quarter of calendar year 2008. In addition to bolstering Microsoft’s enterprise search efforts, this acquisition increases Microsoft’s research and development presence in Europe, complementing existing research teams in Cambridge, England, and Copenhagen, Denmark, with new and significant capabilities in Norway. The offer will be subject to customary terms and conditions, including receipt of acceptances representing more than 90 percent of FAST shares and voting power on a fully diluted basis, and receipt of all necessary regulatory approvals on terms acceptable to Microsoft. The complete details of the offer, including all terms and conditions, will be contained in the offer document, which is expected to be sent to FAST shareholders during the week of Jan. 14, 2008. The offer will not be made in any jurisdiction in which the making of the offer would not be in compliance with the laws of such jurisdiction. Larry Dignan, also from ZDNet, thinks this will lead the rest of the industry to consolidate the same way the advertising industry has been. “Until now organizations have been forced to choose between powerful, high-end search technologies or more mainstream, infrastructure solutions. The combination of Microsoft and FAST gives customers a new choice: a single vendor with solutions that span the full range of customer needs,” said Jeff Raikes, president of Microsoft’s Business Division. FAST, which was founded in 1997, creates the real-time search and business intelligence solutions that are behind the scenes at the world’s best-known companies with the most demanding information challenges. FAST’s flexible and scalable integrated technology platform and personalized portal connects users, regardless of medium, to the relevant information they need. FAST is headquartered in Norway and is publicly traded under the ticker symbol ‘FAST’ on the Oslo Stock Exchange. The FAST Group operates globally with presence in Europe, the United States, Asia, Australia, the Americas, and the Middle East. For further information about FAST, please visit http://www.fast.no/. FAST’s Business is Enterprise Search. Since they have set up their company in Norway back in 1997, they have grown rapidly to become a global organization with offices across six continents. FAST is said to be the forefront of search technology and it knows how to do the heavy lifting, as they claim. With over 3500 installations, many at Fortune 500 and Global 2000 companies, we have an illustrious pedigree. These blue-chip companies rely on us to help them achieve their business goals and they are loyal. If you ask our customers why they remain loyal, they will probably tell you how we exceed their expectations, provide an unparalleled level of service and show a demonstrable return on their investment. In many cases we have fundamentally contributed to their success. In 2005 independent evaluations of our support organization gave us a 98% satisfaction rating. We get tested quarterly. In 2005 we delivered more than 300 successful customer projects on schedule and within budget. We also ran over 100 Search Best Practices workshops across the world with extremely positive feedback. It helps that more than 60% of our work force are engineers and that close to 50 of our engineers have PhDs in relevant fields. They enable us to meet complex needs by delivering simplicity. We are the market leader in Enterprise Search and number one in revenue growth. We have no debt. We have been profitable, exceeding our projections, for every quarter during the last 4 years. And we have made these profits while investing a quarter of our income back into R&D. Performance like this gives us the freedom to invest in innovation and win on value and financial return. Partners give us the ability to deliver total solutions and our FAST X 10 partner program plays a major role in our success. We have over 90 Systems Integrators and VARs on board, and over 30 OEMs embedding our search technology. We have also certified close to 1000 developers in FAST University, drawing on our best-of-breed approach to partnering. Quantity is less important than quality, of course. We only pursue a partnership if there is a mutually beneficial, lasting opportunity. We have been a globally minded company, with a global outlook, since our inception. Maybe it is because of our Norwegian roots. In fact, soon after we opened our doors we established an office in the United States. We now have offices in 6 continents and development centers in 4 of them. Our products support close to 80 different languages. John M. Lervik, Ph.D., serves as the Chief Executive Officer (CEO) and is a co-founder of FAST. Dr. Lervik served as the Company’s Chief Technology Officer from 1997 to September 2001 overlooking all of the company research and product development activities. Dr. Lervik holds a Ph.D. from the Norwegian University of Science and Technology, and was awarded the best overall PhD at NTNU in 1996/97. Other co-founders of FAST are Mr. Thomas Joseph Fussell, who was a co-founder of Fast Search & Transfer ASA and has served as Executive Chairman of the Board of Directors since June 1997 and was Managing Director in 2000 and Mr. Robert Napier Keith, co-founded Fast Search & Transfer ASA and has served as Executive Director since June 1997. Some people think this is a brilliant acquisition for Microsoft. Gartner says that Microsoft is struggling in this (already crowded) market. FAST is recognized as an industry-leader, along with Autonomy, Endeca, ZyLab, among others. The other thing to keep in mind is Microsoft’s biggest bet, which is its DYNAMICS (ERP/CRM) division. Because Business Objects was acquired by SAP, Microsoft possibly became more compelled to make an acquisition. Enterprise Search is going to be an absolutely massive component of ERP in the coming years, and this is a market that is strategic for Microsoft. Fast.no seems to have some issues with its Board of Directors. More information enclosed below. The conduct of Fast’s directors has been the subject of much comment in Norway. In Jan 2006 a article ran in the Norwegian IT paper that claimed that one of FAST’s directors Tomas Fussel had made a 2000% markup for himself by buying a loss making company Hercules communications and selling it to the public company Fast 3 weeks later for a massive mark up. More recently there has been controversy at the board level with one director resigning and another making public statements about other directors and major shareholders. Fast’s board member Robert Keith said in a newspaper interview, “I ought to have seen the problems in Fast earlier. And I ought to have understood that Hans Gude Gudesen is a crazy liar. Also, I ought to have shot Oystein Stray Spetalen the first time I met him. That would have helped a lot of people, says the controversial Brit to the paper [Finansavisen].” Spetalen and Hans Gude Gudesen are both major shareholders in Fast. Furthermore directors Keith and Fussel are allegedly being pursued by the Norwegian tax authorities for $50M in unpaid taxes the government says it is owed by them. In the event of non payment liability may fall on the company. I should have shot Spetalen. On the 12th of December 2007 Oslo Bors suspended trading of FAST shares. The next morning the company announced it was reviewing the accounting utilized for the 2006 and 2007 reports with a likely outcome that this would be changed. In an article titled “Fast restates its accounts” http://www.dagensit.no stated that Fasts results for 2006 and 2007 may be restated in what it called ”another clean up round.” It also stated “The Search technology vendor Fast Search & Transfer have had several rounds with restating of accounts. Also after CFO Joseph Lacson some months ago declared that “everything is cleaned up” one has found skeletons in the closet. Wednesday afternoon trading was suspended, after what the stock exchange called “certain conditions”. Earlier last year FAST has acquired AgentArts, a San Francisco-based technology company with a personalization and recommendation engine for music, video, games and mobile entertainment. AgentArts clients include Infospace Mobile, Telstra Big Pond, Telstra Mobile, and Unipier. FAST said will add the technology to its enterprise search products, which will allow users to see the relationships between content and get recommendations for similar content based on their search patterns. It also includes a social recommendation feature, which helps users discover similar content based on patterns of other users with similar interests. Although Fast Search & Transfer’s core business is widely known to be enterprise search, in 2007 the company seems to have sharply turned towards online advertising and search monetization, which seems the Web’s 2007 trend anyways, everybody is trying to become an ad company, platform or network. Also late last year (2007) FAST, which may be a company best known for specializing in site search, has launched a product platform that is looking to socialize the ecommerce storefront search function. It’s called FAST Recommendations and it is based on offering product recommendations similar to those of Amazon.com, but with a social twist. If some of the information above proves to be true then this is a major, and in time, exit for the FAST’s shareholders.